We're enjoying the frog themed bentos around here, like this one with fresh yellow plums and a silly froggie face with a tongue sticking out, or this one with lots of fresh berries and a homemade flag idea. Today we had another take on a froggie face, but with fresh buns from the grocery store. Faith had a turkey & cheese sandwich inside flaky bun from our grocery (I bought theses for a get together and we had several leftover). 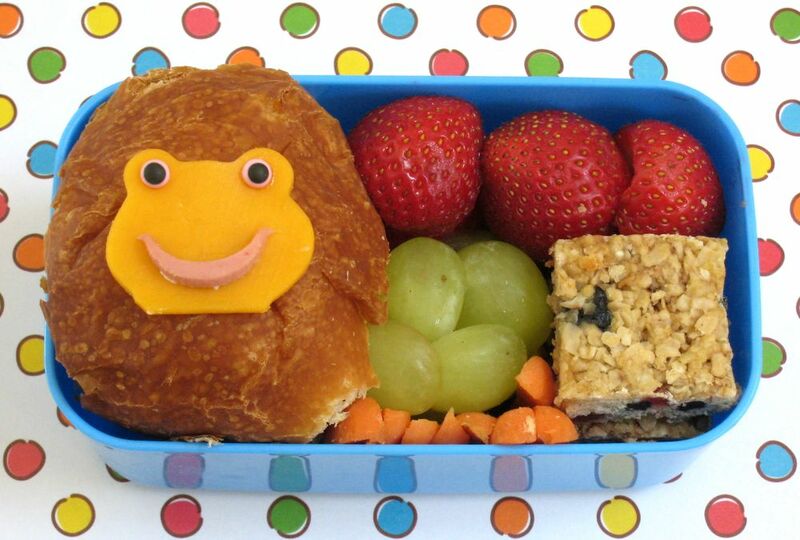 It's topped with a cheddar frog face, sugar eyes and a luncheon meat smile. She also has several fresh strawberries, some sliced grapes, slivered carrot sticks, and strawberry-blueberry granola bars cut into thirds and stacked to fit. Who says granola bars have to be long and rectangular?